19th century map of France depicting its various departments. This beautiful first edition map of France was issued by David Burr in 1832. It depicts the Kingdom of France showing its various departments. Towns, river, mountains and various other important topographical details are noted. Elevation throughout is rendered by hachure. A reference to the departments is included in the lower left quadrant. 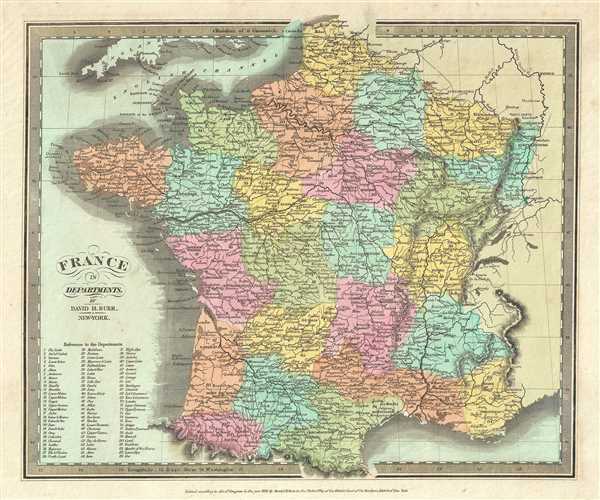 Until 1790 France was divided into 40 provinces based on local loyalties and feudal histories. On March 4th of 1790 the National Constituent Assembly reorganized the Provinces with what the Assembly deemed a more rational political structure. The new department system was intended to deliberately break up France's historical regions in an attempt to erase cultural differences and build a more homogeneous nation. Initially there were 83 departments but by 1800 that number increased to roughly 130, of which 84 are listed here. Many of the departments that were created in 1790 remain administrative districts to this day. According to Ristow, although Burr is credited on the title page, he left this atlas incomplete. He was appointed as topographer to the U.S. Post Office, and of the sixty-three maps finally included in this atlas, only completed eight. The rest of the maps were then completed by Illman and Pilbrow in Burr's style. The map was ‘Entered according to act of Congress in the year 1832 by David H. Burr in the Clerk’s office of the District Court for the Southern District of New York’, but not published until the atlas was released in 1835. Published by D. S. Stone in Burr’s New Universal Atlas. Very good. Minor foxing. Original platemark visible. Minor edge wear. Rumsey 4628.009. Philips (Atlases) 771.